BodyAnew Cleanse multipack oral drops contains three formulas intended to provide homeopathic support for the body’s natural detoxification systems and processes. We’re exposed to chemical, biological and psychological toxins every day. Air, noise, light and electro-magnetic pollution, viruses, cleaning chemicals, artificial food additives, as well as stress related to family, work or finances can all keep our body’s detoxification organs working overtime. This can cause an accumulation of toxins in our body, which can disrupt digestion and elimination, leaving us tired and potentially weakening our immune defenses. 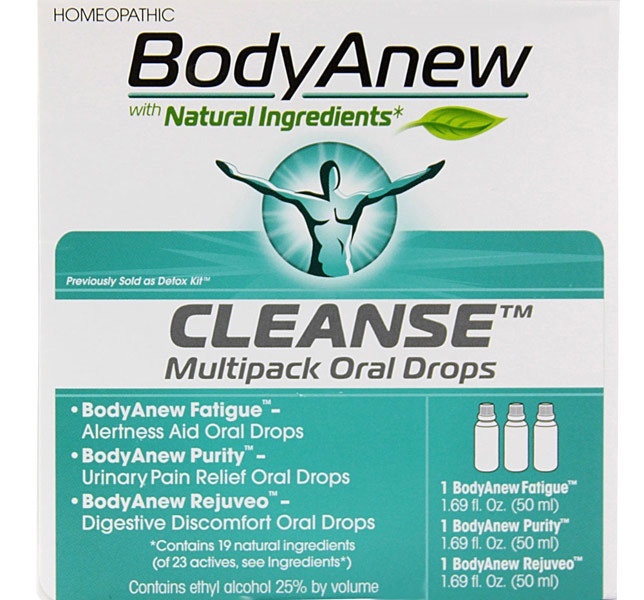 BodyAnew Cleanse multipack oral drops (formerly called “Heel Detox Kit”) contains three formulas intended to provide homeopathic support for the body’s natural detoxification systems and processes. Together, these three homeopathic remedies are designed to promote comprehensive detoxification, specifically to help reduce fatigue and urinary and digestive problems related to an unhealthy lifestyle and exposure to toxins. This multipack kit can make your natural detox or cleanse quite simple. 30 drops per day of each of the three formulas is all you’ll need to improve your mental energy, while reducing uncomfortable urinary and digestive symptoms related to toxicity. Just take 10 drops of each bottle under your tongue, in three divided doses. Each homeopathic formula works gently and synergistically to help support your body’s natural healing and cleansing processes. If you’re ready to start feeling better and reduce some of that toxic load, try this easy cleanse today! Adults and children above 12 years: Pour 30 drops of each formula into bottled or tap water and consume throughout the day. Children under 12 years: Consult your healthcare provider. Warning: Contains alcohol. If symptoms persist or worsen, a healthcare professional should be consulted. If pregnant or nursing, consult a healthcare professional before use. Keep this and all medicines from the reach of children. Inactive Ingredients: ethanol, purified water.